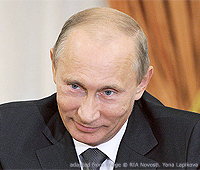 (Interfax – May 25, 2013) Russian President Vladimir Putin has said that to move forward Russia needs to look back at its traditions and roots, Interfax news agency reported on 25 May, quoting the Kremlin’s website. Putin believes that in order “to move forward successfully, we need to strengthen the connection of times, turn more often to our traditions and roots, keep the memory of our national heroes and loyalty to those high moral standards which they have bequeathed to us”. According to Putin, Patriarch Germogen is one of the greatest heroes in the Russia’s history. “In Russia’s darkest hour he turned to his fellow countrymen with a fervent appeal for unity and for gathering forces to repel the enemy and protect Russian land, and his personal example of courage and fortitude inspired people to feats,” the president said. “His appeal was heard, and people united and liberated Moscow and all Russia from invaders, and revived and strengthened the country,” Putin said. Putin expressed his “deep gratitude to Patriarch of Moscow and All Russia Kirill for his enormous contribution to this noble cause, for genuine concern about keeping our collective historical memory and the rich cultural and spiritual heritage”. The public unveiling of the monument to Patriarch Germogen was held on Saturday 25 May near the Kremlin walls. During the Polish invasion in the 17th century, Patriarch Germogen publicly cursed the Roman Catholics and supported the resistance volunteer army and Russian Orthodox faith. He was murdered in prison and canonized by the Russian Orthodox Church in the 20th century.